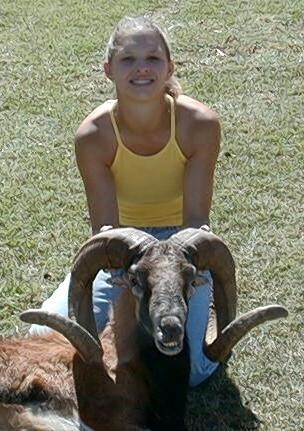 This Hunt is for a $1500 class Corsican Ram. We have Corsican Rams for $300, $700, $1500, and up. This sheep is brown with a black or white belly. The males often have a long black beard on the bottom of their necks. Only the males have horns, which grow up, back, down, forward, back up, and out from the head. A large male will weigh 140 pounds and the female will weigh 75 pounds. Corsican rams look similar to bighorn rams except Corsicans are smaller and they have a beard. They are one of the most popular exotic hunted. They make a impressive great mount.